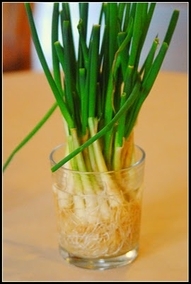 The next time you have green onions, don't throw away the white ends. Simply submerge them in a glass of water and place them on a sunny windowsill. Your onions will begin to grow almost immediately and can be harvested indefinitely. 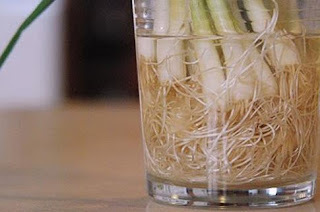 Several of my onions never sprouted (likely because they were pretty old in the fridge) so I tossed them before they funked the water too much, but this technique worked for the majority of my cuttings. According the the site I saw this idea on, you can simply cut off what you need for cooking, and the roots will continue to grow, so hopefully I won't have to buy any more green onions for a long time!